Today it is a challenge to increase their location based profitability. Growing competition, rising rent costs and the online sales are decisive. Therefore, location analyzes are more important than ever. With the help of Geomarketing software retail companies analyze existing and potential sites. The following article gives you an insight into the method set of WIGeoGIS. How many branches are necessary? Where do these locations need to be situated in order to maximize the demand potential? How large does the capacity (square footage) of the locations need to be? Where do the customers of the respective locations come from? Which locations are cannibalizing themselves? Which locations can be closed without losing sales? What effects on neighboring branches can be expected from closing a branch? Simulation analyses answer such questions. Example 1, reorganization of branch networks: Simulation analyses help in reorganizing branch networks optimally, primarily in already highly saturated total markets. Cases show through experience that retail businesses can significantly increase their turnover by relocating branches to other locations. Example 2, calculation of cannibalization effects: Simulation analyses are highly suited to answering the important question of cannibalization effects on retail trade. The geomarketing software calculates the intersections of the catchment areas and the households or residents they contain. Traditionally, extremely high value is placed on ascertaining catchment areas for retail trade. An evolution in ascertaining catchment areas is emerging. The first evolutionary stage is based on simply drawing a given radius around the respective location. The second stage emanates from drive times or real distances as a decisive criterion. Many retailers continue to use this method to this day. In the meantime, however, geomarketing has a third developmental stage to offer. With this development, catchment areas can be significantly more realistically calculated. Underlying the calculations is the idea that there are many determining factors for why a customer selects a store. So-called attractiveness factors are spoken of. These vary depending on the target audience and have to be defined individually for each location. Attractiveness factors can be the size and layout of the sales floor, the portfolio and the parking situation of a store, for example. If one now examines the individually defined attractiveness factors in a spatial context, one is now dealing with the methodology of gravity analysis. Gravity models are a modern geomarketing method for ascertaining catchment areas more realistically and with greater target group specificity. They were developed on the basis of the law of gravity by Isaac Newton. Stated simply, the gravity analysis is based on the assumption that it is above all the attractiveness of a store that is the determining factor for whether a customer feels attracted and goes there. You could also say: the more attractive a store, the more drive time the customer will put up with. If retail businesses rely on catchment areas that are based exclusively on distance, they are possibly giving away customer potential. Gravity analysis takes factors such as purchasing power, household structure and a company’s proprietary customer data into consideration, in addition to distance, they also incorporate the attractiveness factors that are so essential. This makes sense, since a more profound portrait of performance and sales potentials can be represented for a given location. 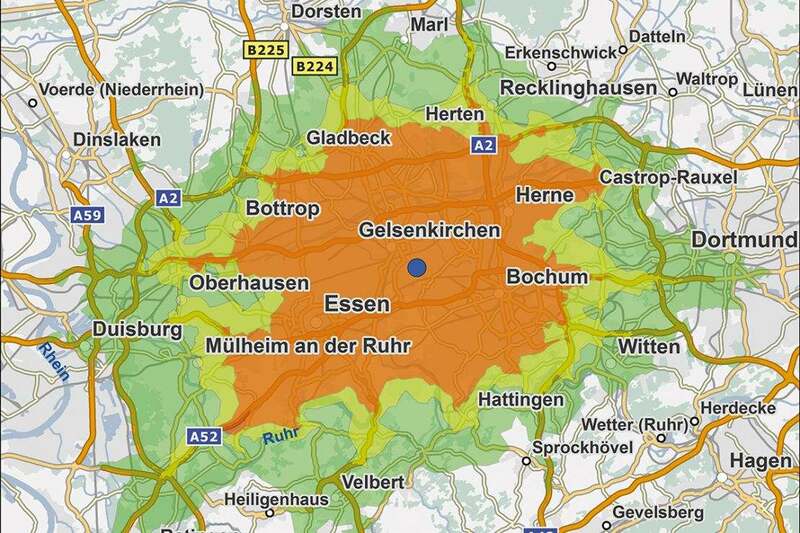 Geomarketing analyses make location-based sales forecasts possible. These can be very precisely represented by means of complex analysis models, such as gravity analysis. For reliable sales forecasts, realistic catchment areas are essential as a basis of calculation. The basis for location-based sales forecasts are data on product range-specific purchasing power or overall purchasing power, resident or household numbers. Location-based sales forecasts support retail businesses not only in deciding on whether or not a potential location will be profitable over the long term, they also assist in the further development of locations, such as whether sales floors should be expanded or the effect of a change of focus in the product range. Such analyses bring not only clarity as to why some articles are shelf warmers, they also provide insights into the products or packaging sizes that have the potential to sell well but which have yet to be introduced to the product range on offer.